The community has made modifications in reaver for him to do the pixie dust attack and automate the process to recover the pin. Other attacks were implemented (Pin Generator) and some improvements have been made. Option (-P) in reaver puts reaver into a loop mode that does not do the WPS protocol to or past the M4 message to hopefully avoid lockouts. This is to ONLY be used for PixieHash collecting to use with pixiewps, NOT to 'online' bruteforce pins. - Collecting repetitive hashes for further comparison and or analysis / discovery of new vulnerable chipsets , routers etc..
- Time sensistive attacks where the hash collecting continues repetitively until your time frame is met. - For scripting purposes of whom want to use a possible lockout preventable way of PixieHash gathering for your Use case. Last edited by t6_x; 2015-05-05 at 16:22.
i like that way you think. it makes everything easier on the long run -good job! thank you very much for your great contribution!!!!!! Awesome Sauce !! Nice job indeed. When run from root I get error below. yes I did sudo make install after compile. Last edited by t6_x; 2015-04-16 at 04:48. 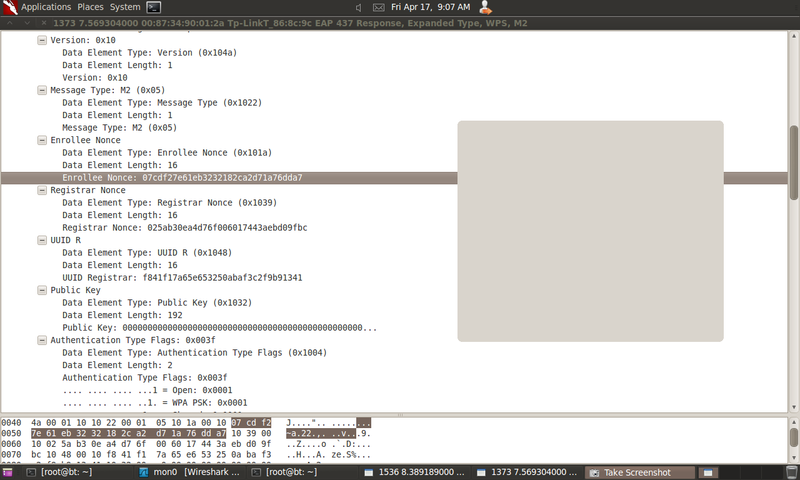 -P option works great, take less screen space if multiple terminals running. Also thanks for the credit.... but u typo my name. if option -K1 fail, does it automatically try -K2 or K3? if -K3 fail, does it check -K1 etc? user must enter new command line each time? Last edited by nuroo; 2015-04-30 at 14:42. Last edited by soxrok2212; 2015-04-14 at 22:50. [Pixie-Dust]   [-] WPS pin not found! It would be a good he already try all the Ks, I'll think of something. Last edited by t6_x; 2015-04-15 at 09:05.
any router? or some router in specific? yesss. That. Keep different functions/improvement separated. In my orginal reaver command, I did not specify a channel on purpose, to troubleshoot. But your code for reaver part2 - passphrase puts -channel automatic -NICE! I guess the AP just so to far away like u said. The -g option in wash for chipset excellent idea. Better to pick targets. Can't wait to try it later. Last edited by nuroo; 2015-04-15 at 21:35. I love the -g option. Just tried it. This is a great idea. Your right it does need a timer and or -rssi strength filter. -P option on purpose have no header, so it can be small in terminal window? This can be done, but I have to think of a more general way to create the function a little better. There are certain things running on a linux but not working in an embedded, I try to come up with something that works cool. What complicates the operation is that it is necessary to make requests to the router so that it responds with all the necessary data. When the router is far away, just that it takes a while to get up to get the message M1 and sometimes not even pass the authentication is because of this that is stopped on the screen waiting. At this point it would be interesting to create multithreaded functions, but must do so in a way that works on all devices, it would not be interesting reworking code for each platform. DataHead think that soon will make portability for bigendian and thus left open for OpenWRT and variants. With relation to the header, I tried to create this function to help people that creates scripts or frontends, it is easier to treat a result already relatively more processed. There comes a time that is difficult to decide what to do, are many options and many variations. Yep ideas are the easy part. Last edited by slmafiq; 2015-04-17 at 13:52. Do you know something about the bug with repeating this pin 99985677 ? I tried to brute-force one D-LINK 501 but with this bug i can't. I see that other users have the same bug. The link that you gave me it is not clear what is happening. It is hard I analyze the problem without having a router that has this defect, you tried to work with the options -1 and -2 to set the pin in a different position this? So, what is wrong maybe i'm using -W opt incorrect ? Well, it just might be the fact that you're using a D-Link generator for a TP-Link AP... but no, that can't be! Last edited by soxrok2212; 2015-04-17 at 21:18. You realize that the -W option works for two types of routers? D-Link and Belkin, and only for some models of these companies? You are trying to use the D-Link generator on a router TP-Link? sorry, i was too much obvious. Thank you for explanation and your work! I found only 1 D-Link router but it gave me the same problem. I believe it's one of "some models of these companies" which are protected. Nice work matey, many thanks. I've got a question, what does "-P, --pixiedust-loop" do? and when should it be used?. 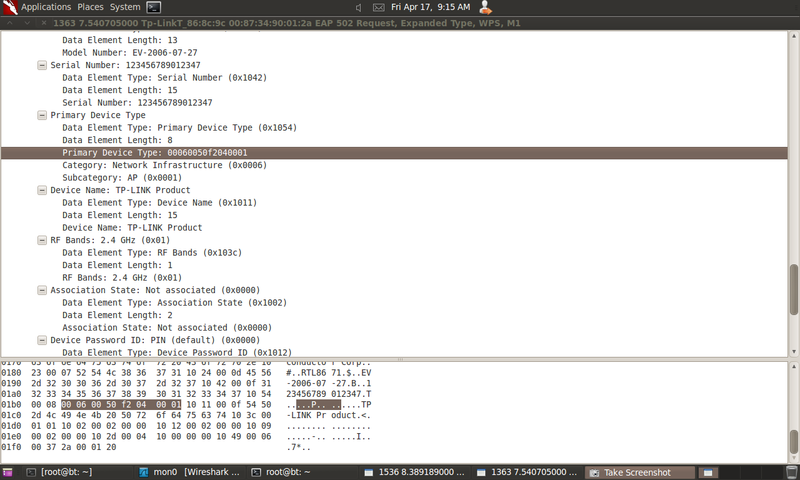 I took screenshot on Wireshark .. M1-M2-M3-M4 messages and trying screen..
Why Pixiewps does not work for TP LiNK RTL 8671 EV 2006 27 07 (Realtek)? Last edited by Saydamination; 2015-05-16 at 21:05. 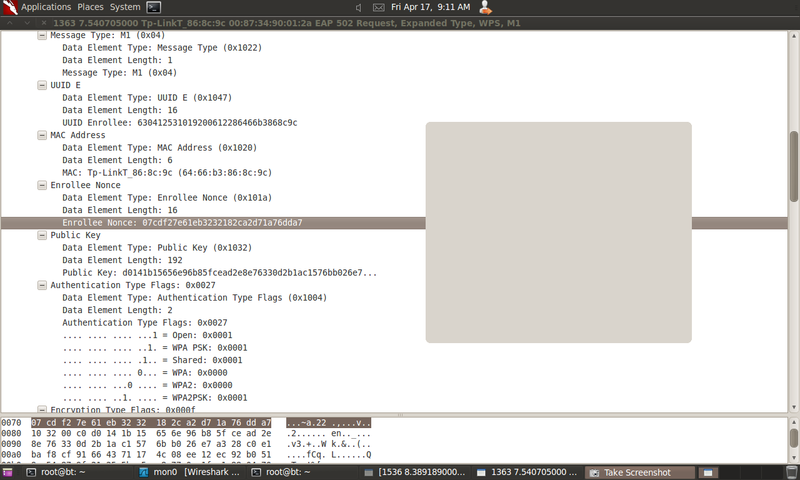 It stops the wps exchange after the M3 message is received. This way (hopefully) we will avoid any lockouts... the router will report a failed WPS exchange and won't count it You should only use it when attacking via Pixie Dust. If you are doing a regular old 11,000 pin brute force, don't use it. Just confirming the latest version on git (1.5.2) requires on the K 1 option to test all 3 chipsets now ? Because the failure of the pixiedust takes advantage, is a firmware failure and not a chipset failure. ..............:52:A1  -66  24     1160      336    0   6  54e. WPA2 CCMP   PSK  1.0 LAB,DISP  999 Kane  Belkin International Inc.
..............:37:56  -83   0        5        0    0   6  54e  WPA2 CCMP   PSK  1.0 LAB,DISP  999 Kane  Belkin International Inc.
Next Step? Try all three pins? ..............:52:A1  -66  23     5527     1778    0   6  54e. 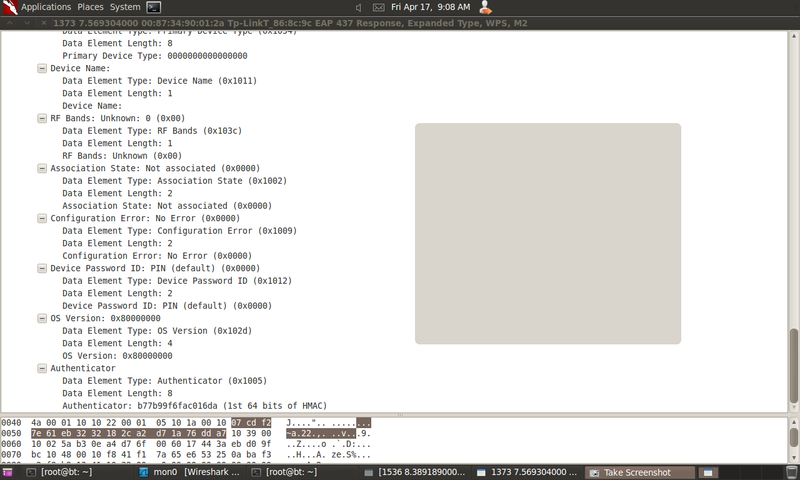 WPA2 CCMP   PSK  Locked        999 Kane  Belkin International Inc.
..............:37:56  -77  77     1776        0    0   6  54e  WPA2 CCMP   PSK  1.0 LAB,DISP  999 Kane  Belkin International Inc.
Should I try other pins after I try unlocking the router? whats the correct reaver command after pin found? Linksys was recently acquired by Belkin... that is why it shows the Manufacturer as Belkin. However, based on your reaver output, you are attacking a Linksys WRT1900AC... which technically is NOT a Belkin router. Thanks for the info.....I just went by airodumps manufacturer, silly noob, I should have seen that. reaver with or without small keys? Some of the first part may not be available, but if they are it would be helpful. And I can find the rest in the cap. Last edited by nuroo; 2015-04-19 at 19:43. After tests and reviews, the best way to handle the situation is to make all possible attacks at once, even though much lighter time for this, the machine I'm using, takes about 1 min to finish one single pixiewps. But even so, it is more practical effect only once, than to divide the attack on some other options. I already was not very happy with the options, al soxrok2212 finally convinced me that it was better to have only one. So the answer is yes, the only option -K 1 run pixiewps with all the arguments, the pixiewps turn when it receives all the arguments he makes all bruteforces known until the moment. This is because of the following. Not to know what the Mac that the router is using to generate the pin. 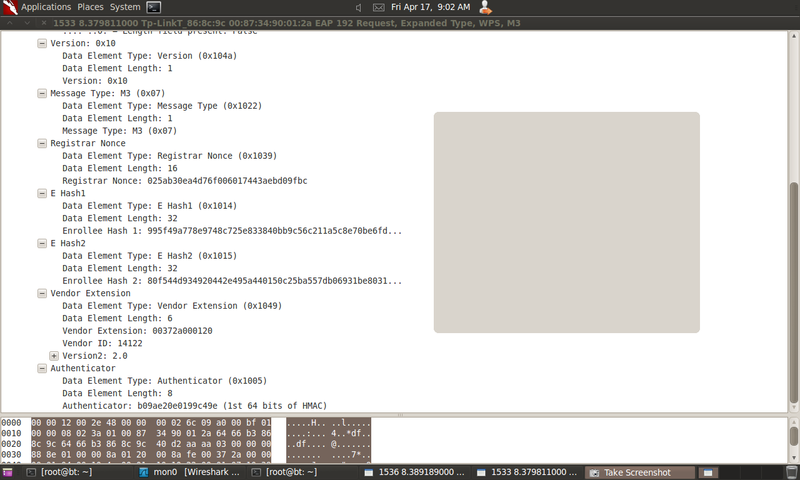 So first it generates the pin for the BSSID used. After it generates the pin for the BSSID + 1, which is the MAC added +1 on the last value, that is why many routers Mac is sequential. Now with relation to the loop, missed the -vv option to really know what was going on, but I believe the pin gen generated not the correct pin and he was in the same loop trying to pin up the router go into lock. So far found only one router that the pin gen managed to generate correctly. In my area, the centurylink with a ZyXEL C1000Z is common... what kind of cap is needed? a full handshake right? 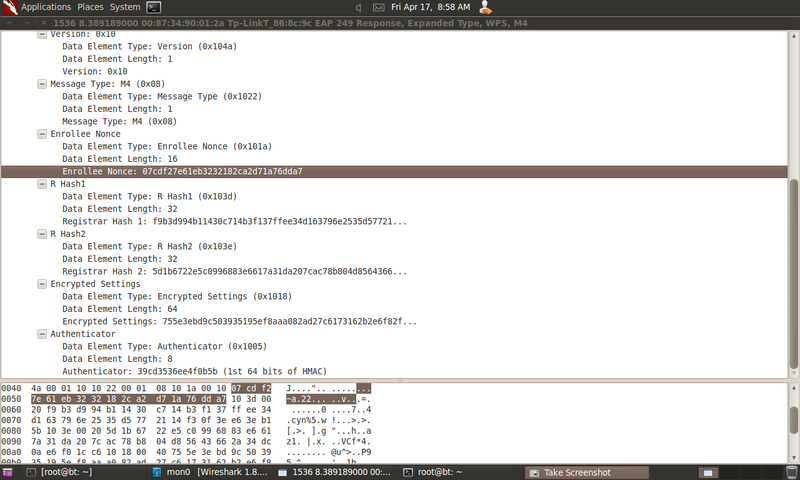 and then a seperate txt with an unrelated set of pke/r ehash1/2 auth and nonce for that ap? ----Collecting repetitive hashes for further comparison and or analysis / discovery of new vulnerable chipsets , routers etc..
----Time sensistive attacks where the hash collecting continues repetitively until your time frame is met. ----For scripting purposes of whom want to use a possible lockout preventable way of PixieHash gathering for your Use case.